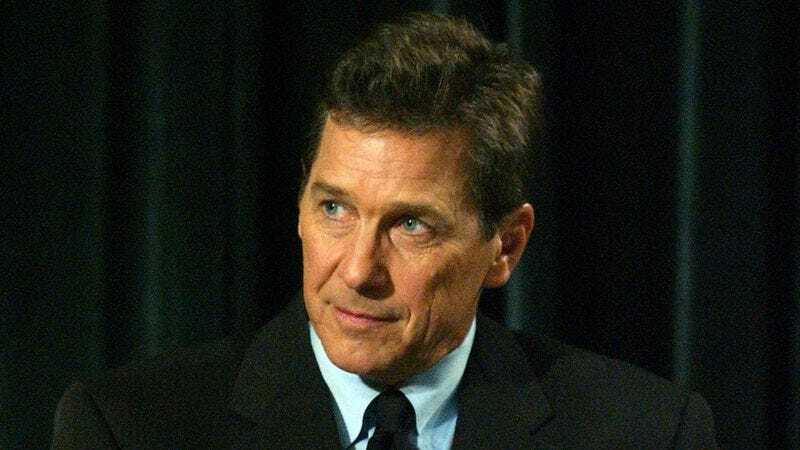 The actor: Tim Matheson, who began his career in the ‘60s as a teenager in sitcoms, cartoons, and TV melodramas, then blossomed as a comic actor in the late ‘70s, thanks to his central role in National Lampoon’s Animal House. Matheson has worked steadily as a film and TV actor for five decades now, and has also branched out into directing, helming such action-driven shows as Burn Notice and NUMB3RS. Matheson’s latest film as a director (and actor) is Behind Enemy Lines: Colombia, the third movie in the series. Tim Matheson: My character is sprinkled through this, but I actually shot the entire part in two days. The A.V. Club: As a director, you’ve been drawn to more action-oriented projects, which seems strange, given your background. TM: I just love genre. Action is one of the genres. Comedy-action is something I like to do too. Burn Notice is kind of comedy-action. I love horror films. And I like chick flicks! [Laughs.] I like to approach the different genres of moviemaking and explore them. And you get a little better the more you do them, so that’s probably why I’ve focused mostly on action and comedy over the last couple of years. AVC: Were you already living in California when you got into the business? TM: I was born and raised in L.A. My father was born and raised in L.A. So we’re old hands here. AVC: Was acting something you wanted to pursue, or did your parents push you to get into it? TM: That was one of the most fun things I ever did, and I gotta tell you, I worked with some of the best actors I’ve ever worked with: Mel Blanc and Don Messick. They could play a scene against themselves. Think of the characters that Mel created, and they’re as good or better than any performance anyone has ever given. I mean: Daffy Duck! Think of the specific voice Mel gave Daffy Duck or Bugs Bunny or Porky Pig… It’s just astonishing. When I did Jonny Quest, I was in that gawky stage between kid and adult. I wasn’t working much. So I focused on studying, and I really learned what it means to be an actor. And here I was on Jonny Quest,working with all these great people from back in the golden age of Hollywood, who came up doing radio. These were journeymen, working actors. It made me proud, and gave me some insight into what acting was really about if you weren’t a star. Though you know, they used to send a car for Mel and Don every day. Don lived up here in Santa Barbara. They would drive him down and he would go from studio to studio and job to job all day long. Then the limo would drive him home at night, because he was such a valuable commodity. Mel was equally as talented or even better. It was a great education. AVC: You’ve done a fair amount of voice work over the years. Is there a different kind of craft involved when it comes to acting with your voice? Do you prepare in a different way? TM: It’s a little… bigger. It’s interesting. There is something about the vocal quality of the actors who can really do it. Jim Burrows, the great sitcom director who directed Will & Grace and Cheers, when an actor comes in to audition for him, he never looks at them. He just listens. Because funny is funny. You can be fooled by the eye, but if your performance is funny to the ear, it will be funny. I think it’s that if you don’t have the visual, you have to infuse the full personality into the voice. Again, think of Daffy Duck. I mean, what the heck? I was playing around with the Daffy Duck voice today when I was coming back from driving my kid to school. Where did Mel come up with that? What are those things? It boggles the mind. TM: I learned a hell of a lot from my co-star, Kurt Russell. He’s one of my closest friends and was one of my best teachers. He was the pro. He approached it like a baseball player. Acting is a contact sport to him. He’s one of the most optimistic, fun, wiseacre type of guys I’ve ever have run into. You can’t be pompous around him. I used to take acting so seriously, but after we did the Quest pilot and the show sold, Kurt said, “You know, you work too hard. You’ll make yourself sick. You can’t work that hard doing a series, because it goes on so long. It’s like a baseball season. You’ve got 162 games. You can’t just go all-out the first week or two. You can’t maintain that pace.” And it’s true. Then he said another brilliant thing. He had starred in umpteen movies by that point. And he said, “Generally speaking, in every film I’ve done, there are only about three or four scenes that I can really do something with. For the rest of it, it’s not so much that you don’t have to prepare, but there’s not much you can really do. You just do what is asked of you in those scenes. You don’t want to do too much.” He’s so smart. It was a great insight. You don’t hear technical stuff like that taught in acting school. It’s the kind of sage wisdom coming from a guy who was 25 at the time, but already had 20 years of experience. He’s a wonderful actor and a great guy. The Quest was a treat. AVC: So you knew right away this wasn’t going to be just another teen sexploitation comedy? TM: Yeah, because it was so singular. John Belushi infused it with this spirit of guerilla filmmaking. Landis came from that world too, and all the National Lampoon writers were from that world. It was just chaos on film. Controlled chaos, though. We stayed very close to the script. It was a very formal kind of movie, if you look at it. Formally photographed and structured, with certain elements of improv. It was the best thing John Landis ever did. It was a brilliant script. AVC: You mentioned the visual style. You’ve since become a director yourself, but were you paying attention back then to how scenes were constructed visually? AVC: What’s the advantage of the cool lights? TM: Speed. It was the new technology at the time. I’d been working on more traditional movie sets and TV shows at Universal. All of a sudden, here we’re on location, and it’s down and dirty and quick. It was the way the new commercial world was shooting; the way the indie world was shooting. These were lighter, faster cameras. It was a generational change. When we started shooting and I read the script, I realized “They could cut this part out in a second.” But he’s great. Steven’s one of the most visually talented and character-oriented directors I’ve ever worked with. And I learn from him every time I watch one of his movies. Good or bad—and he has made some awful movies—they’re never uninteresting. He’s made four or five of the greatest movies of all time. Perfect movies, like E.T. or Schindler’s List or Saving Private Ryan. I also think Duel is perfect for a television movie. I liked Munich a lot too. So whenever I study a genre of filmmaking, he’s the first guy I go to. Even Catch Me If You Can, which is a very lightweight kind of thing, if you just look at the economy of the way he designs his shots and works around actors, the craft is amazing. AVC: Had you ever worked with him in his TV days? TM: No. I was under contract with Universal at the same time, but we never met. I did a Night Gallery, but not with him. I wish I had. AVC: You mentioned 1941 not quite being as funny as you’d hoped. Can you tell that sort of thing when you’re still in the filmmaking phase? Or are there times when you’re shooting where you think the movie’s going to be hilarious, but then you see it on the screen and it just doesn’t work? TM: I think you could tell with 1941. It was never on the page. I read Animal House and I said, “I will burn down a house to be in this. I have to be in this movie.” I read 1941 and I went, “Well, if Steven likes it…” [Laughs.] But it just wasn’t on the page. It was a very big, unwieldy thing, and there were so many characters. It was fun to shoot, but I didn’t know what the core of it was. The core of Animal House was about prejudice, about equality, and about inclusion/exclusion. It was about a group of people who were together and anything went. Anybody who wanted in could get it in. Then there was that other group that nobody could get in, unless they were white, and just alike. It was very representative of the culture in the ‘60s, ‘50s, and ‘40s in America. So at heart it was about some very deep things, even though superficially it was about hijinks and fun and college and rebellion. But I never knew what 1941 was about. What’s the human story that all these characters have in common? To me, as a director and an actor, that’s the main thing. “What’s the heart of this story? What’s the humanity of this story? And if the movie doesn’t have it, then why am I watching it?” Even if it’s a silly comedy, like Superbad or Knocked Up—Judd Apatow, I love, because he’s all about heart. The humor comes out of the humanity. With 1941, I kept looking for the heart and humanity in my character. I mean, I know he just wants to get laid, but what’s the twist on that? Does he fall in love? What’s the extra beat there that makes everyone in the audience go, “Aw, I really loved that”? TM: I’d come up with one leg in theater, but never my first leg. I loved the camera too much. But I’d always bounced back and forth. The great thing about theater is the doing it again and again and again, but with Bus Stop, that was for HBO, and I played to a camera and not to the audience. You know, I’ll never forget John Heard doing Shakespeare In The Park with Raul Julia and Richard Dreyfuss. It was 30 years ago, I guess. It was Othello, and John Heard played Cassio, and while everyone else was “Acting!” Heard came on talking normal, and everyone in the audience was leaning in to follow him. I wasn’t doing that in Bus Stop. I think in that performance, I was putting it out a little too much. TM: This was the first television I’d done in a while. It was just before Moonlighting, and just before you could get a little more outrageous on TV. We had a great premise. Cathy Hicks is a great actress, and we had a good rapport, and we wanted to make it just more human and playful, because I don’t think we see enough playfulness between characters on TV. It’s like, “Who really gives a damn about two detectives on a case?” The sillier we went, the better it worked. But directors would come in and say, “Oh, no no no. Don’t do that!” And I would say, “Just shoot one that way. Just one take.” So, my frustration there was that they wouldn’t let us run with it. As an actor and a director, I always let my actors go… assuming they have good ideas. TM: That could’ve been a good show if we’d done it before an audience. Sam Kinison was so charismatic, but he needed an audience. It would’ve been so much better if we’d gotten away from all this special-effects nonsense of having him be on my shoulder. It was cute, and maybe they used that device to sell it, but we should’ve just done it with a live audience, because Sam was amazing in front of a live audience. What a tragic character. I just adored him, but you could just see the train wreck coming. He was one of the most compulsive people I’d ever seen. Belushi was that way, and Chris Farley was that way. He was incredibly talented and made me laugh so hard, and there was nothing he wouldn’t say. Such a unique, amazing, cynical, realistic, but still optimistic look at life he had. It was great fun to get to know him. AVC: Given your background in The Groundlings and your work with National Lampoon, do you think of yourself as firmly entrenched in the comedy world, or are you just a visitor to that world? TM: You know, I jump back and forth. I never did Saturday Night Live, although I knew all those people and hung out with them. When Belushi was alive, I used to visit a lot. But that’s sort of the standup comedy world, which is the toughest thing. I did a show with Stephen Bishop once, and I said, “You guys do the most dangerous thing in the world.” And he said, “Oh, I have a very strong technique.” And he explained it to me. He said, “I have A-material, which is the best; B-material, which is a step down; and I have C-material, which is sort-of-okay stuff. When I come out, I start with the C-material. And if they laugh at that, that’s all they get. And if they’re not laughing, then I’ll start going to the B. I’ll throw a B out there, and if they laugh and they keep laughing at the B-material, then that’s all they get. And if they don’t laugh at the B-material, I’ll hit them with the A-material. And if they don’t laugh at the A-material, I am fucked.” [Laughs.] All of a sudden, I understood the workmanlike quality of a good stand-up. They all have this. There’s a technique for everything you do. But boy, it’s tough, ‘cause there ain’t anybody else out there but you. TM: I got to work with one of my dear friends, Michael Ritchie, who ended up being my next-door neighbor for several years. And Chevy Chase, finally. I’d known Chevy a bit, but I’d never gotten to work with him. Chevy had been a bad boy with a drug problem, and had never really realized his potential. Fletch was the first movie he sort of straightened up on. And Michael was Harvard-educated, 6’6”, a brilliant director and political thinker. He was the guy the studio thought could handle Chevy, and keep him in check. And he could. He’d shoot the movie the way he wanted it, then do one take for Chevy. When I worked with Chevy, he’d say, “Just ad lib and try to break me up. Just insult me. Anything.” When we were doing his close-up, or when my back was to the camera, I would come up with jokes or quips or anything, to get a real reaction out of him. He was smart enough to know that was gold. So it was great fun working with him and Michael, and getting to see how the two worked together. I think Fletch and Clark Griswold were Chevy’s two best roles. He’s so incredibly talented and still vastly underused. I don’t even know what he’s doing now. TM: I love JFK. My mother had been a worker on his campaign and adored him. I was just a kid when he was around. I did a lot of preparation, a lot of research. I can’t do him… I sort of get a slight Boston accent, and I tried to get his rhythm. My only fear was that I was too old to play him, because I was much older than he was when he died, so I was concerned about that. But it was one of those, “Oh what the hell, I’m doing this. It’s a great part, and I’m going for it.” So I just tried to have fun. And I loved working with Joanne Whalley; she was so much fun. She’s a real trooper. Martha Inc. was fun too, but it wasn’t much of a part. Cybill Shepherd, I’ve known forever and she’s great, but it wasn’t much of a part. The interesting thing about that movie was Jason Ensler, who directed it. It was his second TV movie. He was a USC film-school grad, and I like working with new directors, so in that regard, it was great. I like new talent and seeing how they work. Jason had a great DP, Paul Sarossy, who also shot for Darren Aronofsky. Paul and Jason did some really neat stuff. And we were one of the first movie companies to shoot up in Nova Scotia, and what was so funny about it was, they weren’t very adept at making movies up there yet, so the sets weren’t extremely well-built. They’ve gotten much better, but at that point, you’d slam a door and the whole wall would fall down. They’d be like, “Well, don’t slam the door.” What do you mean, “Don’t slam the door?” [Laughs.] That’s not how we do it in Hollywood, for Chrissake! AVC: Do you think the idealism of that show has had any impact on the current political climate, with people yearning for a White House that’s more like the Bartlett White House? TM: I think that idealism is always there in this country. I think Aaron captured that in The American President too. It’s a spirit that’s been subverted lately, and sold down the river to the contractors, what with the privatizing of all aspects of the government. It’s so cold and cynical—all dollars and cents and parcel it up and sell it out and downgrade it and outsource it. They don’t consider what it does to people. It started with Reagan, when he took away the financing to the California universities. It used to be cheap to send your kids to the UCs. They’d call it an investment, because the more you educate people, the more they’ll pay in taxes, because they’ll get better jobs. But Reagan said, “No, it’s a cost, so you’re going to have to pay the cost.” So now people can’t afford to get an education. Anyway, I don’t want to get too political, but yeah, I think the spirit of this country is finally coming back, and hopefully it will triumph.